Olea europaea. A gnarled olive tree. A clambering grape vine. Caper bushes spilling down the hill. An olive tree, just one, evokes memorable landscapes from Andalusia eastward to the Levant. We are pleased to offer exceptional new varieties, including the renowned Bella Di Cerignola, Cailletier and Lucques. Full sun and good drainage required. Expect harvestable crops in about three years. The first fruits are almost all pit and no meat and it's best to remove them, although few people can bring themselves to do it. You must process olives within a few days of harvesting, whether for oil or table, or they'll start to decompose and the end result will be inferior. Never use olives that have fallen off the tree when curing or pressing. 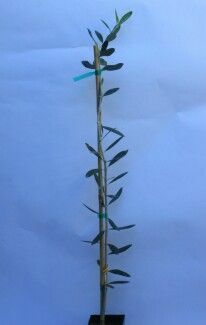 Olive trees bear their fruit on one year old shoots. To promote this growth, prune your trees in spring. You can pinch the branches of new trees or prune back branches of established trees. Olive trees won't bear fruit twice on the same wood, so remove bearing shoots from the previous year each spring. If you want to enhance growth, be sure to fertilize well. Seaweed not only provides boron, which olives need, but it also helps trees survive cold weather. Well-aged manure, dolomitic lime and greensand provide an excellent top layer food source that will slowly and safely release nutrients to the trees. In colder climates, grow olive trees in a pot that can be brought into a sun porch during the winter. Olive trees need at least 100 hours of temperatures below 50 degrees in the winter, so keep this requirement in mind when considering growing olive trees indoors. Zones 9-10 outdoors, where trees grow to about 20-25 feet. Please read varietal descriptions for pollenizer requirements, although many olives will bear a crop without pollenizers. Fruit and new growth injured at 26 degrees, tree injured at 16 degrees. A note on the olive fruit fly: it has become established throughout California olive growing regions. You can control it organically by using Spinosad, but diligence is required. A second note: olives prefer dry conditions and are prone to fungal disease in areas of high humidity, such as many areas of the Southeast. Thomas Jefferson, a great gardener, had his heart broken over his olive trees' intransigent refusal to produce a harvestable crop at Monticello. Ground shipping charges are 35% for CA, 40% for OR, WA,AZ and NV, and 45% to rest of U.S. Orders received by Fridays at 5 pm PST will be shipped the following Monday if weather allows. Sorry, no shipping to AK,HI. 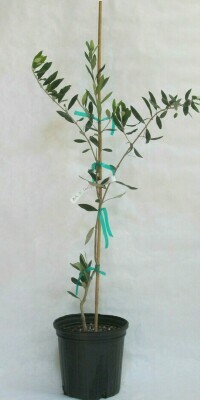 Yet another choice table olive courtesy of Tuscany, the Santa Caterina is a big, billowy tree with matching drupes. The very large olives are harvested an emerald green for the table and come in early, usually September. A vigorous grower that will withstand colder temperatures than other varieties. Will produce much bigger crops with Pendolino or Frantoio within 200 feet. As of October 2018, trees have sturdy trunk, pruned to 3' tall, no branching yet. Grown in 4" x 6" pots. Despite its delicate looks, Picholine is nevertheless a sturdy grower and one of the shorter cultivars. Read details in 2 gal item description, above. 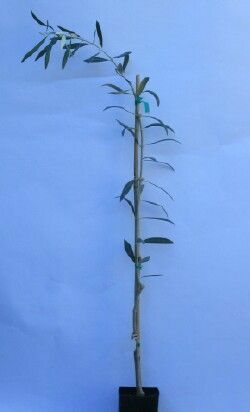 Grown in 1 gal containers, trees as of December 2018 are about 3' tall, branching, narrow caliper. A classic California dual purpose olive, the Manzanillo drupes are rounded with a high flesh-to-pit ratio and firm, meaty flesh. Generally harvested early when green. Tree has a low and spreading canopy so remove the lower branches as needed to suit your landscape. Self-fertile but higher yields with Ascolano as a pollenizer. Sturdy grower. Trees as of June 2018 are about 2.5' tall, branching, loaded with blossoms. Grown in 4" x 9" pots. More established version of the Manzanillo above in grower pot. 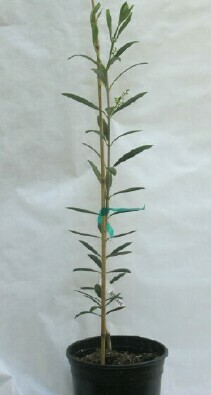 Plants are about 3.5' tall, branching, size of photo as of June 2018. Grown in 2 gal pots. These Arbequina trees are about 3' tall with a few branches, smaller than photo as of September 2018. 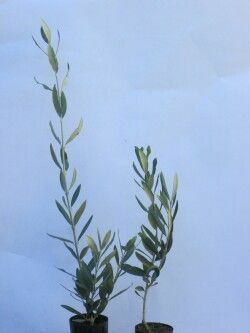 Young olive trees grow quickly their first few seasons, and then decelerate to their typical slow growth rate. Grown in 4" x 9" containers. Koroneiki trees have dominated Greek olive groves since Homer wrote The Odyssey and no doubt dipped bread into the peppery oil we still enjoy thousands of years later. Koroneiki olives are smaller than other varieties, matching the compact growth pattern of the tree. Small, thick leaves. Oil has very high oleic acid content. One of the more tender varieties. Self-fertile. As of September 2018 trees are about 3' tall, some branching, smaller than photo. Grown in 4" x 9" containers. Bella Di Cerignola may offer the most beautiful and delicious olives of any tree. It ripens early and is generally brined soon after turning a celadon green. Drupes are huge, nearly a half ounce of crisp, buttery meat. Hailing from Puglia, this tree has a spreading canopy with gracefully weeping branches. Appreciates being well-fed and watered. Will produce greater harvest with the pollenizers Coratina, Pendolino or Leccino. Grown in 2 gal pots, this new crop of trees is smaller than photo, about 2' tall including pot, 3/8" caliper, a few branches as of December 2018. OUT OF STOCK UNTIL LATE SPRING 2019. The primary varietal used in Tuscan oil production, the Frantoio olive tree is useful to the home gardener as well. This olive tree is self-fertile, meaning it doesn't require another variety to set fruit, but is also an excellent pollenizer to other olive trees. 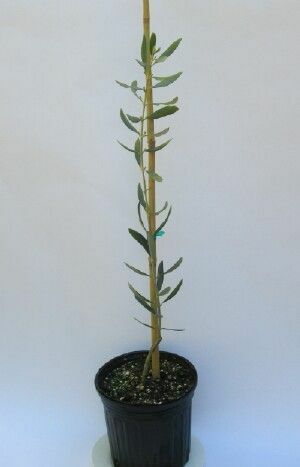 The Frantoio olive tree grows in semi-pendulous fashion to about 20', with dark green-gray leaves. The fruit also makes a good table olive after curing, with a slightly nutty flavor to the medium-sized fruit. Perfect for container planting with silver thyme and oregano. Grown in 5 gal containers, this new crop is about 4' tall and well-branched as of June 2018. Trunk caliper is about 1/2". OUT OF STOCK. A vigorous and upright grower with slightly twisted and substantive green leaves, Ascolano is prized for the huge size and delicate taste of its olives. Since you can't get something for nothing, the downside is that Ascolano olives bruise easily and then you can't cure them. So harvest carefully. Fruit set is also fairly low. Doesn't turn black when ripe. Also used to produce a light and delicate oil. Ascolano is the most cold hardy of the Tuscan cultivars. Partially self-fertile, but you'll get more drupes using pollenizers Frantoio, Leccino, Pendolino or Manzanillo. Trees are about 3' tall, much larger than photo as of October 2018. Grown in 4" x 6" pots. Known in cooking circles as Nicoise, Cailletier olives pack a lot of nutty, intense flavor in a small package. Cured black. Main cultivar around Nice, France. Tree is vigorous, large and eventually pendulous. Generally self-fertile. Watch out for olive fruit fly on this one. Grown in 4" x 6" pots. OUT OF STOCK. The more established version of the Cailletiers in 4" x 6" pots, above. These 2 gal trees are about 3' tall, branching as of September 2018. You know an olive must be exceptional when David Leibovitz sings its praises. These olives are challenging to find in markets so all the more reason to grow your own, even if you don't have a Languedoc potager. See below for cultural requirements. Trees as of October 2018 are about 2' tall, branching, narrow caliper, smaller than photo. Grown in 2 gal pots. OUT OF STOCK. An easy grower that prefers adequate irrigation, with an upright habit and high productivity of delicious olives picked green for curing. Ripens late. The primary French cultivar and for good reason. Best yields if pollenized with Picholine. As of September 2018 trees are much larger than photo, about 3' tall, sturdy caliper, branching. Grown in 4" x 6" pots. OUT OF STOCK.